Being very popular today, Scandinavian style originates in Northern Europe. Clear lines, colors, designs and surfaces make the Scandinavian style so attractive, beautiful and desirable. How to create perfect Scandinavian styled interior? Scandinavian design, Let’s consider some basic tips and principles of how to choose the right color palette, furniture & accessories. Scandinavian style is accessible for everyone and does not require large sums of money. Expensive and affordable furniture are equally good for Scandinavian styled interior. The mission of the style is to bring simplicity and provide maximum of coziness. In terms of design, Scandinavian is much simpler than demanding Loft and sophisticated Traditional styles. Scandinavian vibe is easy to achieve by using simple decoration ideas and mix accessories, color palettes and furniture. 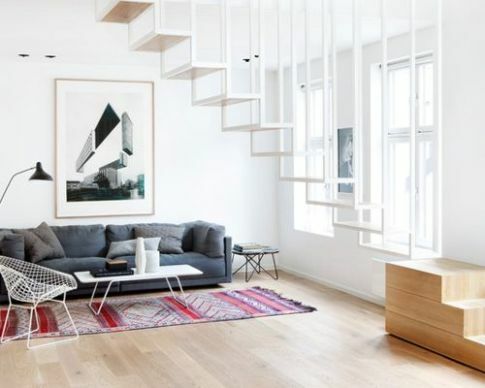 Because of light color palettes, light toned wood furniture and simple decor solutions without additional highlight furniture and shiny accessories, Scandinavian style visually expands the area and brings more air and light without losing coziness. It’s a genuine cheat for small areas and compact flats, where the useful space is the most crucial thing. Scandinavian motivated interior is seen as furniture built from natural wood with unfinished textures. Wooden floors are a perfect bottom which you can build beautiful and inviting liveable space. Unlike other styles such as modern, commercial and art deco, Scandinavian uses minimum of synthetic materials to bring natural look and feel. How to create perfect atmosphere of Scandinavian style? Provide your room with a good amount of sunlight. Refrain from use of big/heavy curtains and additional accessories. Opt for blinds / curtains made of light linen or don’t use curtains at all. · To make your living space brighter and cozier, use white/light paint for walls. To enliven the overall look of Scandinavian minimalism, use some bright accents such as stripes of vibrant wallpapers, vibrant paintings/wall art, images and photos. · Use wooden furniture. Scandinavian style is a synonymous of all natural and organic. Natural solid wood can’t go wrong with anything. It serves as a perfect option for furniture flooring, frames and walls. Scandinavian influenced furniture is usually made of unfinished (finished in clear lacquer) solid oak, beech, hardwood and such as birch. Complete natural look of wood flooring with a multi-colored rug. Natural hardwood in mixture with cozy rug will surely provide your house with comfort. Provide additional comfort and complete your chair with highlight toss cushions, couch and loveseat. Table light fixture with bright tone is an excellent way to include some playful appear and feel to a discussion area. The crucial thing is never to mess up minimalist idea of Scandinavian design with way too many multi-colored and shiny items. Use minimal to attain maximum. Scandinavian is nearly the same as modern minimalism with addition of light color natural furniture, palettes and simplicity of lines. Scandinavian style is a perfect choice for individuals who appreciate comfort and spaciousness in interior decor.